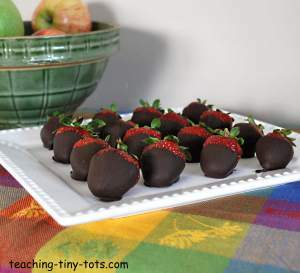 Toddler Recipes: Chocolate Dipped Strawberries! 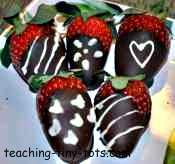 Fresh, ripe strawberries dipped in milk and dark chocolate and decorated with white chocolate...a sweet treat! Wash strawberries and let dry leaving leaves and stems intact. Melt chocolate in bowl. Since microwaves vary, times will vary. Heat until just melted. Chocolate should be warm not hot. Chocolate scorches very easily and will taste burnt if heated too long. Microwave 60 seconds on 50% power, stir well, and repeat 30 seconds at 50% power until melted. 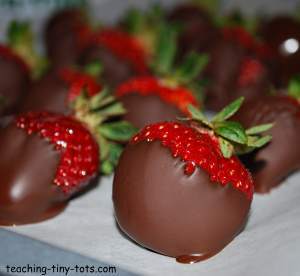 Dip and roll so chocolate covers entire strawberry leaving a little uncovered at the top. Gently swirl strawberry to allow excess to drip off. Place on waxed or parchment paper and for best results refrigerate until ready to eat. Place on a dish or in little candy cups to serve. You know your toddler best and will have to determine how much he or she can assist with. Chocolate should just be warm...it will get on their fingers and hands. We found that a very small microwaveable dish worked best. We put 3 squares of Baker's Chocolate in it and it was just the right height to dip easily. Guide their hand when dipping if necessary. Strawberries with stems are easier to hold or with firm green tops. If not use a toothpick to poke in the top to hold. I found that placing a cube of white bakers chocolate placed in the corner of a freezer ziplock worked well. Heat until just melted and snip very, very tiny tip for a fine line to make designs. This was easy for the girls to make dots and stripes. The best strawberries are ones you pick from a local strawberry farm. They are sweeter and juicier than those grown for shipment. Plan ahead since the local season lasts about three to four weeks long. When purchasing strawberries from the grocery store, select the most fragrant and firm fruit with no mold or bruises. 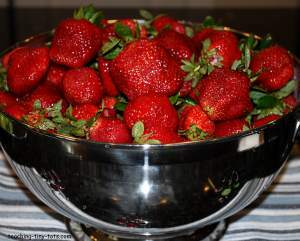 Strawberries do not ripen once they are picked so choose a container with a bright red color. The caps and stems should be bright green and fully attached to the strawberry. Usually the small to medium berries will be sweeter than large one. Select berries that are in dry containers. Containers with strawberry stains main indicate over ripe berries that are not freshly picked. If you find mold on a strawberry, throw it out, it spreads quickly to other strawberries.